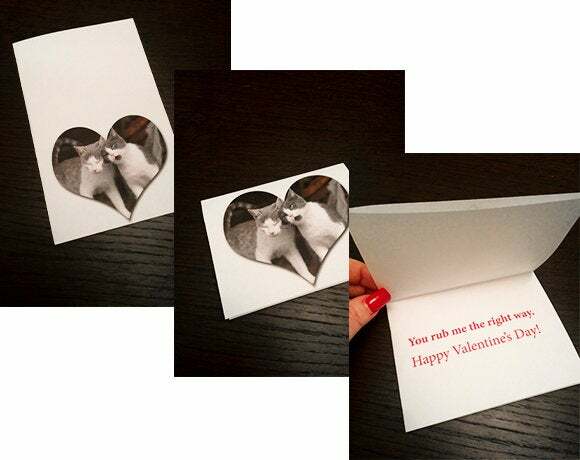 Learn to create a simple yet classy Valentine cards. Unless you’re fortunate enough to live near a Trader Joe’s, affordable greeting cards are hard to come by. If you no longer enjoy paying $6 or more for a greeting card, you can use your Mac to create a unique and personalized card that your loved ones will cherish. 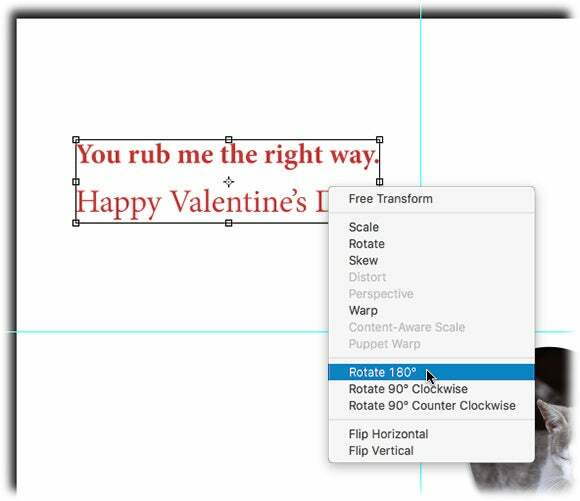 In this column, you’ll learn to create a simple yet classy Valentine cards using Photoshop or Photoshop Elements (nearly any version of these apps will work). To keep it budget-friendly, we’ll use standard size paper and then fold it. 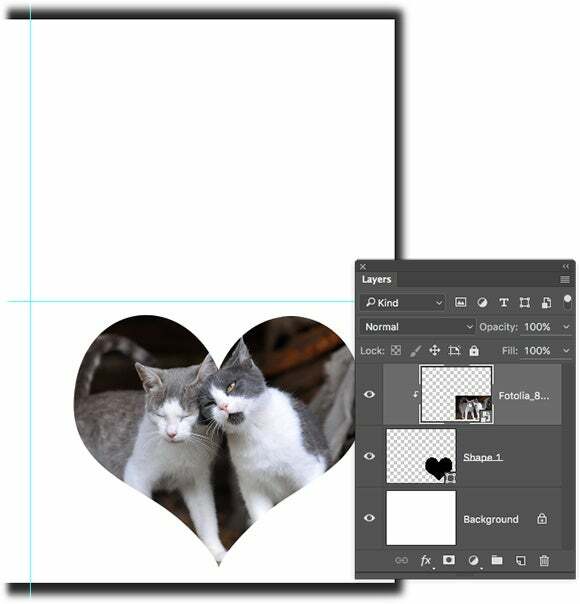 We’ll also utilize the built-in shapes included in both apps to frame a photo with a heart shape, so you don’t need to buy additional imagery. In Photoshop, choose File > New and in the resulting dialog box, enter 11 inches for width, 8.5 inches for height, and 300 for resolution. In Elements, click the Expert (or Full Edit) button at the top of the workspace and then choose File > New > Blank File. In the dialog box that opens, enter the same dimensions. Next, let’s set some guides to aid in aligning the art and text we’re about to create. In either app, choose View > New Guide and create a vertical guide at a position of 5.5 in (for inches). Choose the same command again and this time create a horizontal guide at 4.25 in. Here’s the New Guide dialog box in Photoshop. Be sure to enter the unit of measurement when creating guides. Locate the picture you want to use and in either app, choose File > Place (in Photoshop CC 2015, choose Place Embedded or Place Linked) and navigate to where the art lives on your hard drive. It appears surrounded by resizing handles. Drag within the box to position the art at lower right quadrant and then Shift-drag a corner handle to resize the art so it fits within the guides. Press Return when you’re finished. 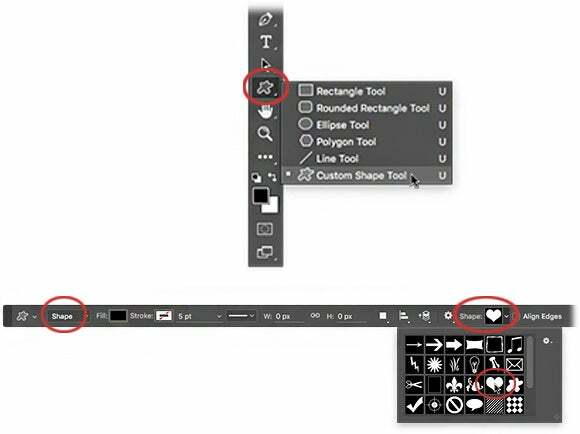 In Photoshop, activate the Custom Shape tool (it looks vaguely like a starfish) and in the Options bar, choose Shape from the menu at the left and then click the Shape preset picker and click the heart in the resulting panel. 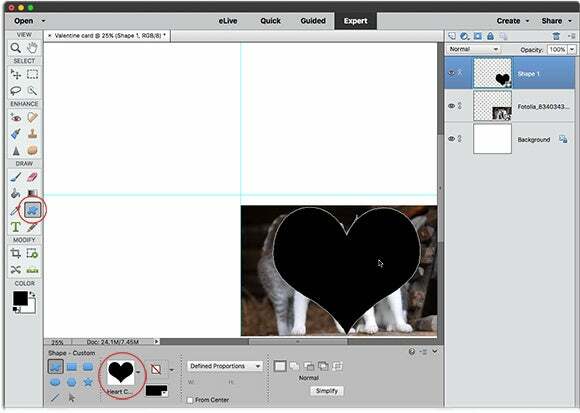 In Elements, grab the Custom Shape tool from the Draw section of the Toolbox and in the Tool Options panel, click the Shape preset picker and in the panel that opens, click the heart. Here is Photoshop’s Tools panel (top) and Options bar (bottom). 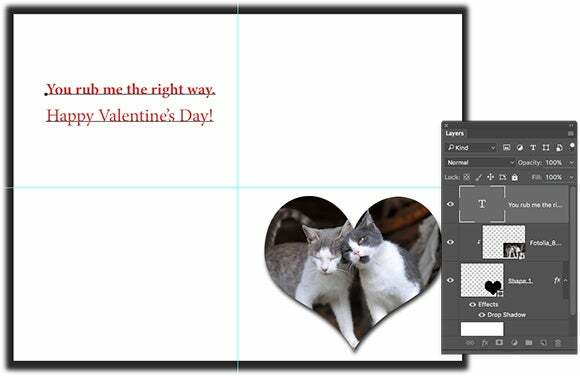 Mouse over to your document and, in Photoshop, Shift-drag diagonally downward to draw a heart that surrounds your focal point; in Elements, you don’t have to hold down the Shift key. To reposition the heart while you’re drawing it, keep holding down your mouse button, press and hold the spacebar on your keyboard and then drag with your mouse. Don’t worry about what color the shape is because we’re about to shove a photo through it. Here’s what our document looks like in Elements. The Custom Shape tool and Shape preset picker are circled. In the Layers panel of either app, drag the shape layer beneath the photo layer and then Option-click the dividing line between the shape and photo layers to create a clipping group (your cursor turns into a square with a down-pointing arrow). The photo now shows through the heart. To reposition the heart or the photo inside it, activate the layer you want to move and then press V to activate the Move tool and drag it into place. To move both layers concurrently, Shift-click to activate them both and then use the Move tool. If you decide to increase the size of the shape, click to activate that layer and press Command-T to summon Free Transform. In Photoshop, Shift-drag any corner handle outward to enlarge it; in Elements, drag instead. The goal is to center the photo’s focal point within the heart and then center everything within the lower right section of the document. Feel free to embellish the shape layer with a stroke (outline) or drop shadow. To do that, activate the shape layer and in Photoshop, click the fx button at the bottom of the Layers panel. In Elements, click the Effects button at the bottom of the workspace and then click Styles at upper right. Use the menu at the top of the panel to pick the embellishment you want and then click one of the presets that appears to apply it. Click to activate the photo layer and then press T to activate the Type tool. Click within the upper left quadrant of the document and enter some clever text. Use the formatting settings in the Options bar (Photoshop) or Tool Options panel (Elements) to style it the way you want. When you’re finished, rotate the text by 180 degrees. To do it, ensure the text layer is active and press Command-T to summon Free Transform. Control-click or right-click within the box that appears, choose Rotate 180 degrees in Photoshop or Rotate Layer 180 degrees in Elements, and then press Return. Rotating the text ensures it appears properly when you fold the card. When you’re finished, fire up your printer and choose File > Print. 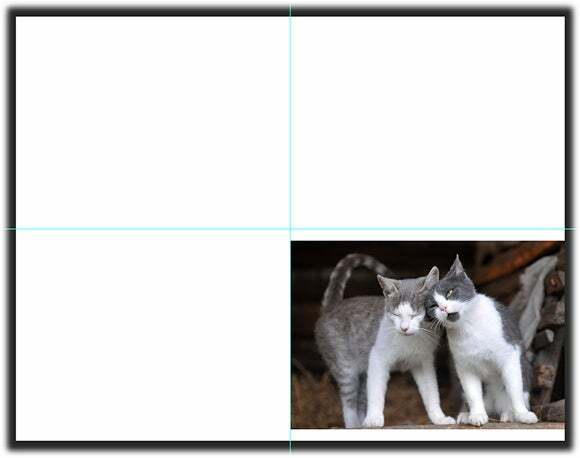 In the dialog box that opens, click the landscape orientation button, set your paper size to 8.5 by 11 borderless, and set the quality to maximum (in Photoshop, you need to click Print Settings to get to paper size and quality options). Grab your print and fold it in half along the vertical guide that you set and then fold it in half again along the horizontal guide. As you can see, it’s not difficult to create your own cards. While this design is simple, those skilled in Photoshop or Elements can get creative by adding other embellishments, textures, and backgrounds.